We have developed a toolkit of VIs we would like to package and distribute to end-users. In the previous exercises, we built these VIs into a package using Package Builder and we reorganized the palette items. Now, we would like to add example VIs, a help document, and a LabVIEW Tools menu item to our package. 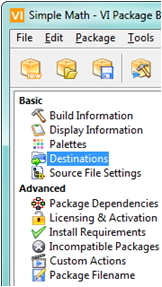 Open the Package Builder in VIPM and switch to the Destinations category in the left-hand menu. Observe the preset destinations and their corresponding settings. These destinations follow a recommended folder naming convention for LabVIEW add-ons. New destinations can be added using the button below the Destinations list. 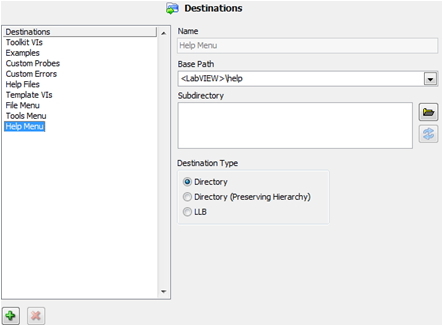 Change the Destination Type to Directory. Select the Tools Menu destination. Select the Help Menu destination. 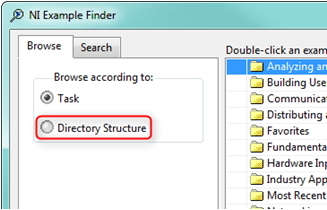 Note: The default setting of Directory (Preserving Hierarchy) will copy the source folder hierarchy over to the destination folder and thus does not apply to this example. Now, let’s switch to the Source File Settings category. Select the _Examples folder in the source file list. Uncheck Use Destination of Parent Folder. Select Examples from the Destinations drop-down menu. Select the _Help folder in the source file list. Select Help Menu from the Destinations drop-down menu. 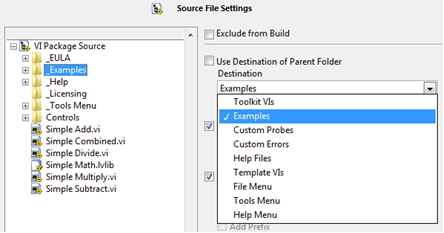 Select the _Tools Menu folder in the source file list. Select Tools Menu from the Destinations drop-down menu. 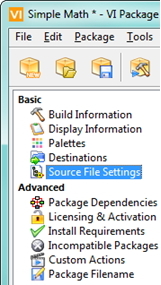 Build the package using either the Build Package button or Package > Build menu option. Choose the Open Package in VIPM Main Window option. 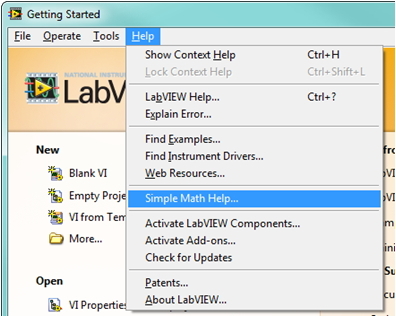 Select LabVIEW 2011 and click on Install. Click Continue. Click Finish. Now, to view our examples click on the Show Examples button. In order to view the new tools menu item and Help document in LabVIEW, we will need to close LabVIEW entirely and open it again. Please do so now by selecting File > Exit in LabVIEW. 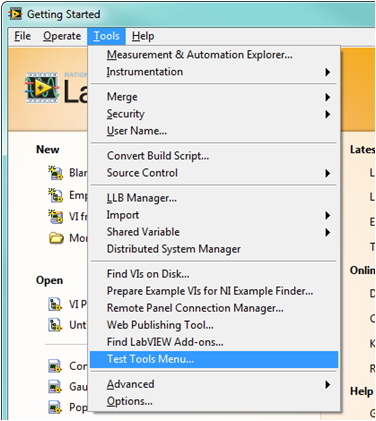 Upon opening LabVIEW, you can now access the new tools menu item we added by clicking on Test Tools Menu…. Similarly, you can find the help document we’ve added under the LabVIEW Help menu. 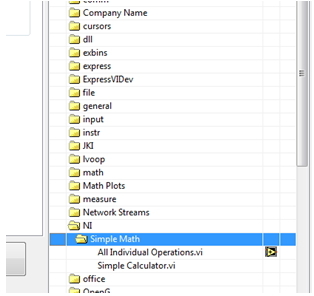 Open the NI Example Finder under Help > Find Examples… in the LabVIEW Help menu. Choose the Directory Structure radio button under the Browse According to: heading. You can find the shipping examples we added to our package under NI > Simple Math. Click here to return to the table of contents, or continue to adding an End-User License Agreement. I built a package recently using VIPM, and there is several subforders in my examples forder. After I built this package and install it, I clicked the Show Examples button, and it open one of my subforders. My question is how can I control which subforder the Show Examples button will open? Or can it just open to the subforder? For example, just open the NI forder but not Simple Math forder in the picture below.